I’m Waiting For the Man. In early December 1966, Bowie’s manager Ken Pitt took Andy Warhol to lunch. Pitt was in New York on a junket and was interested in Warhol’s “house” group, the Velvet Underground, having designs on being their UK promoter. Warhol stared, made gnomic statements, let Pitt pay for lunch and agreed to let Pitt promote the VU at his own expense (nothing ever came of it). So Warhol gave Pitt an acetate of The Velvet Underground and Nico. When Pitt returned to London a few weeks later, he in turn gave the disc to Bowie, who immediately fell in love. In particular with side 1, track 2: “I’m Waiting for the Man.” So far in his career, it’s been hard to find any passionate influences in Bowie’s music, in the way of a performer being in awe of a predecessor and so needing to find means to honor and overcome them (viz. : Dylan with Woody Guthrie, Keith Richards with Chuck Berry, Clapton with Robert Johnson, etc.). 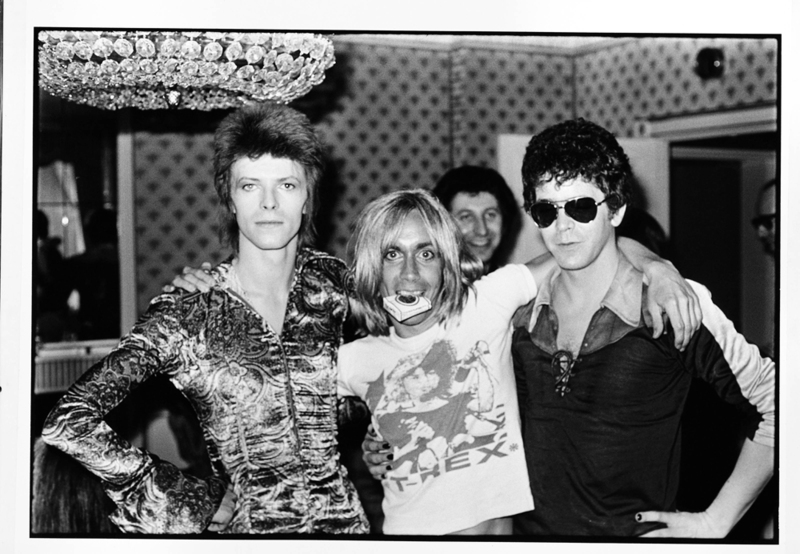 But now, all at once, Bowie had found Lou Reed. He also decided to record a cover of “Waiting For the Man” while finishing up his debut LP. The result is an exercise in cross-Atlantic sonic dilution: Reed and Sterling Morrison’s dirty wall of guitars are replaced in part by a wheezing harmonica and a saxophone mainly repeating two riffs. Worse is the demotion of the piano to mere chirpy accompaniment: in the VU track, John Cale’s spike-driving percussive playing is the sinew and the heart of the piece, the agitated pulserate underneath the singer’s cold reportage. And the studio drummer’s no Mo Tucker. It’s a pretty atrocious combination and the track was wisely scrapped. Bowie’s vocal is fascinating mainly in that it’s a shameless attempt (and a fairly decent one, it should be said) to imitate Reed’s deadpan New York singing—though there’s some Dylan mixed in there as well. Bowie latched on to “Waiting for the Man” because, he said later, it felt real, it felt like a dispatch from the street—one that made Bowie’s own attempts at realism, like “London Boys,” seem like the work of a child. But of course Reed himself was pure middle class, a college graduate who had recorded doo-wop as a teenager and who only a year before was writing cheap pop exploitation songs for a knock-off label. Something like “Waiting for the Man” had as much to do with reading Hubert Selby novels as it did with actual street life, a fact that Bowie would have appreciated had he known it at the time. Bowie would play “Waiting for the Man” for decades. For the BBC alone he cut it four times, including a hard rock 1970 take with Hype (his first glam band) and two 1972 takes with the Spiders From Mars, in which Mick Ronson’s guitar dominates, so glam shine and swagger supplant the sordid jitter of the original track: it becomes a celebration of The Man, with the junkie left a bystander in his own story. But sometimes when Bowie played the song during his 1972 tour (one version from Santa Monica, in August ’72, was released as a single decades later), he slowed it down and sang it wearily, suggesting the country blues that the song originally was. His obsessive covering of “Waiting For the Man” (the oddest version is likely the 1976 louche funk edition), year after year, suggests, uncharitably, that Bowie secretly wanted people to think of it as his song, and certainly some who first heard the song during the 1972 Ziggy tour assumed as much. It’s more fair to say that “Waiting for the Man” was a song Bowie felt he ought to have written, that he needed to write in order to progress, and so he spent years trying to shake loose its secrets. It became the imported cornerstone of his canon. The initial studio take was recorded in late December 1966—possibly Jan.-Feb. 1967; on bootlegs like The Forgotten Songs of David Robert Jones.